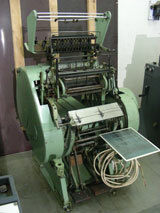 Specifications : Thread Sewing Machine, Martini Model FK III s/n 3215. Sewing width 23"
Specifications : Size: From 3 1/8" x 5 7/8" small to a 12 3/16" x 14 15/16" large,150 cycle per minute,Mechanical Belt Programme, Manufacturer: MECCANOTECNICA Italy. Specifications : Headopp Feeder fo sewing machines with vaccum pump. Specifications : Muller Martini Sewing Machine with Auto- Hepp Feeder, Size 12"
Specifications : Sewing Machine Size 12"
Specifications : Size: 12", Chain Feed. Copyright © 2004 PEERLESS PACK. All rights reserved.